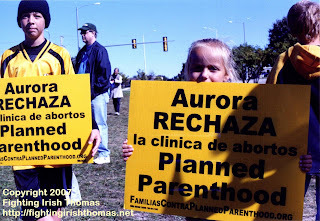 Most of you FIT readers are already well aware of the Aurora pro-life victory yesterday. Judge Charles Norgle delayed the opening of the Planned Parenthood clinic (which was scheduled to open today) "to give both sides more time to present their evidence." The Chicago Tribune not only gave the story front page news, it actually gave the pro-life side a decent if not great shake. "I've never seen an issue that has galvanized the pro-life community like this," the Tribune quotes Eric Scheidler as saying and backs it up with positive reaction around the country including in Denver, where Colorado Right to Life has not only drawn inspiration from the Aurora outpouring of faith, but is borrowing many of its tactics. On the Planned Parenthood side, Cecile Richards, PP Federation of America president (who agrees with Eric that Aurora is "ground zero" for the abortion battle) admits, "it's been a while" since she has seen anti-abortion protests on this scale but like bad ol' local PP President Steve Trombley, she can't seem to get herself to use the "A" word in print. "There are people who need to get health care in a timely manner ... we're doing everything we can to get open," chimes in Trombley while Richards' "choice" of words, "All of us are fearful this is going back to the bad old days where women were harassed going to health care clinics," is also curious given the gravity of the situation. Indeed, not withstanding the so-called neutrality of the article, the pro-lifers come off as sincere folks who despite the many different denominations are of one heart and mind, whereas pro-choicers are seen as smoke and mirror specialists, if not outright liars. But even though the much prayed for delay has come to pass, we need to not only keep focusing on the goal, but who the real opponent is (Satan and his demons) and the strategy needed to defeat them. Christ has set up a whole array of saints (right on schedule I might add!) to come to our aid, not to mention legions of angels just around the corner. Daily Mass Catholics know it was no coincidence that St. Robert Bellarmine, the Doctor of the Church who specialized in "controversial theology" was yesterday's saint, and that his legal expertise came in handy in influencing Judge Norgle to at least delay the case to give it a more thoughtful ruling. Meanwhile, Thursday, the day Norgle is scheduled to decide, is a mighty day of martyrs. Not only is there Andrew Kim, Paul Chong and the over one hundred Korean martyrs who were tortured and beheaded for the faith in nineteenth century Korea, but Blessed Thomas Johnson, one of the earliest English martyrs of King Henry VIII, and St. John Charles Cornay, a brave 1837 victim of the Catholic persecution of Vietnam. Cornay's case in particular (where he was tortured then beheaded then had his body "hewn into pieces and thrown in the river"), bares some eerie similarities to some suction type abortions, and he and all of these martyrs are no doubt waiting to be asked to come to the aid of the unborn whose lives are being threatened with a similar fate as their own. And if we get past Thursday, I see a vision in my mind's eye of a great battle, beginning on Sept. 29th, the feasts of the archangels, Michael, Gabriel and Raphael. Michael and his legions will then become engaged in a horrific three-day war with Satan and the fallen angels for control of the city. Indeed for a time the battle will seem lost, but on Oct. 1st, the feast of St. Therese, there will suddenly be showers of roses from heaven, and Michael will present his Lord with a proclamation of victory. The next day, the feast of the Guardian Angels will be declared a day of celebration and dancing as the fallen young patriots of abortion will join with their guardians in celebrating with the pro-life forces throughout the land. Speaking of "the young patriots," my blog Fighting Irish Thomas also began a year ago on the archangels' Sept. 29 feast day, and my first entry was my poem in tribute to the victims of abortion. And, looking at the photograph above this blog, my wife and I wonder if the figure in the shadow isn't one of them, a young patriot with weapon, coming back to join the fight. But whether you see this image or not, there can be no doubt that they have, along with the saints and angels, enlisted in Our Lord's pro-life army, and whether or not it plays out as my Aurora vision suggests, there can also be no doubt we will WIN this fight. So continue to protest, fast, pray ... and BELIEVE. Fighting Irish THomas, I like this article but I don't think the baby in the picture has a weapon. It looks like it is being connected to PP in some way. Like against its will. Keep UP hte good fight.